"This informative and scholarly book presents both challenges and solutions in current applied linguistics research. The 23 chapters range broadly and deeply across the diverse terrains of contemporary linguistics. The outcome is a set of highly authoritative accounts of ethically responsive and politically attuned strategies for researchers. Highly recommended!" "Students of applied linguistics are invariably frustrated by the gaping lacuna between the rosy, trouble-free picture painted by their methodology textbooks and the intractable messiness of real research they find themselves in. This excellent collection of contributions by seasoned applied linguists takes novice researchers behind the scenes and shares rarely heard stories of how thorny and often unexpected problems have been overcome in a creative, productive, and rigorous way." "This book is an excellent introduction into the imperfect world of applied linguistics research. 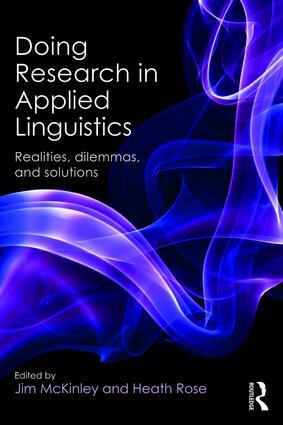 It offers advice and solutions to many problems that applied linguists face while conducting their research. It will be an essential point of reference for postgraduate research students and will make a worthwhile addition to the libraries of established academics." 24. Publishing from a dissertation: One book, or many articles? Jim McKinley is a Lecturer in Applied Linguistics at the University of Bath, UK. Heath Rose is an Associate Professor of Applied Linguistics at the University of Oxford, UK.